Our Halloween potluck party and costume contest went pretty well on Wednesday. I took a gingerbread upside-down cake topped (bottomed?) with freshly picked rhubarb and apple from my garden. 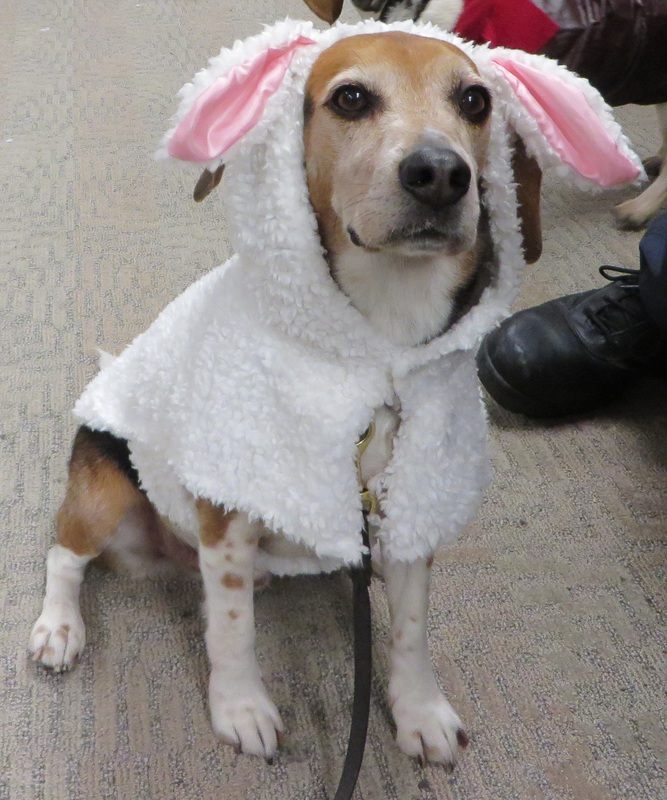 Benny showed off his version of a beagle in sheep's clothing. Thursday I harvested most of my winter squash and late-season watermelons. Those should make for some nice fall and winter meals. I also had an unexpected harvest when I discovered that the entire top half of my persimmon tree had broken completely off. ~_~ It was probably mostly due to the weight of the fruit (serves me right for not thinning them out in the summer I suppose), though I can't discount the possibility that the destruction was hastened by the actions of squirrels or raccoons or other wildlife. 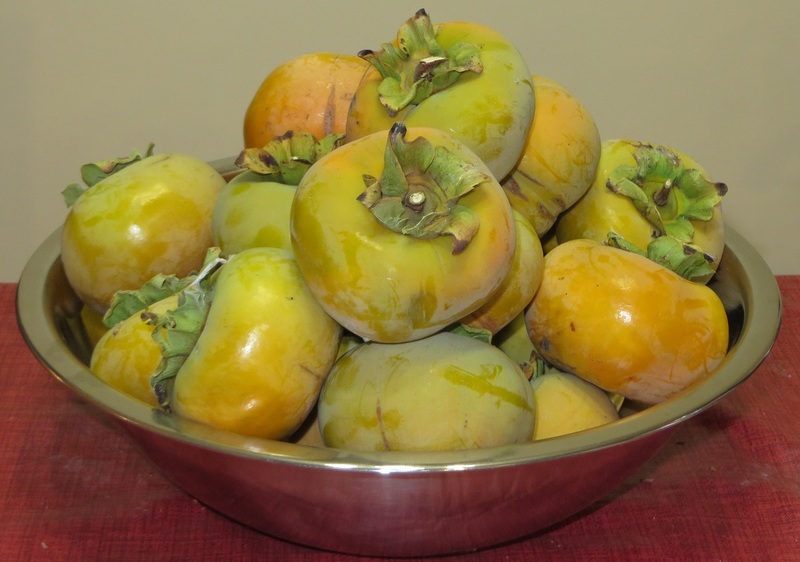 Now I have a heaping bowl of unripe persimmons that I salvaged from the broken part of the tree. I'm hopeful that they will eventually ripen enough to be eaten. Fortunately, there was still one major branch on the tree below where the trunk cracked. I bent the branch upward and tied it to a stake so that it would remain vertical. That should fool the tree into thinking that the branch is now the trunk. (Young trees are relatively flexible that way.) It's still a setback, but not as bad as it could have been. While spending time out in the yard, I checked on my milkweed. One of the first things I did when I moved here was plant a native milkweed in the back yard. It is a perennial that has gotten larger every year, though it hasn't produced any flowers yet. This week, however, it surprised me by sporting monarch caterpillars for the first time. Yay! It's very exciting news about the monarch caterpillars! I haven't seen any such ones on our milkweed leaves. I have seen some leaf damage, so I assume there must have been some caterpillars since I don't know of anything else that would dare to eat milkweed leaves. Benny makes an adorable sheep. So cute! I hope the new persimmon trunk works out well and that the harvested fruit ripens. 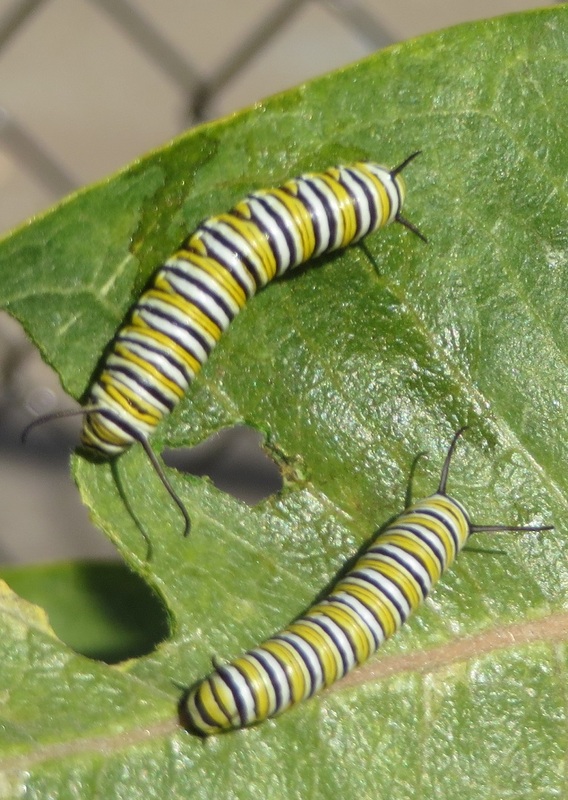 It's very exciting news about the monarch caterpillars! Yeah, I hope they do well out there. I wish I could have gotten him to sit still for better pictures, but all those potluck food smells were too enticing. Thanks. I'll be flipping through my cookbooks looking for recipes to try. Of course, jam is always good if all else fails. Benny's costume is too cute! Did he get to wear that on the job? People would have mobbed him. That should fool the tree into thinking that the branch is now the trunk. Did he get to wear that on the job? People would have mobbed him. No, we would have gotten in trouble for that. We held the costume contest inside the CBP office. I admit it, I fool my trees into doing strange and unusual things. Don't trust beagles, even bearing gifts. Benny's costume is so precious! What other kinds of costumes were there? Thanks! One of the beagles was Tigger, and another was the World War I Flying Ace Snoopy. If you need any more milkweed seeds, I know where you can get lots, haha. I was hoping to propagate this one, because it's a native California species, but it's just being so stubborn about producing flowers. If I don't get any next year, I may take you up on that.